In January 2007, the Commission directed Canadian Nuclear Safety Commission (CNSC) staff to initiate research studies on tritium with the objective of enhancing the information available to guide the regulatory oversight of tritium processing facilities and tritium releases in Canada. In response, CNSC staff initiated the Tritium Studies Project (the Project) in June 2007. Staff provided the Commission with the conclusions of the Project in 2010. Certain follow-up activities were recommended and these were reported to the Commission in 2013 while still in progress. All follow-up activities are now complete and a final summary of the work, along with relevant information on related strategic research concerning tritium, was presented to the Commission in November 2017. This document is a follow up to the CNSC’s Tritium Studies Project Synthesis Report and it summarizes the activities that staff have been involved in to address the recommendations from the Project. Altogether, the Project has met its overall objectives of increasing the scientific information available regarding tritium releases and enhancing the regulatory oversight of tritium-releasing facilities. Based on the research previously presented to the Commission, and the subsequent work undertaken by CNSC staff, CNSC staff conclude that adequate provisions have been made through existing regulatory mechanisms for the protection of Canadians from exposure to tritium releases. CNSC staff will continue to ensure that the latest developments in tritium science are integrated, as appropriate, in regulating tritium-emitting nuclear facilities. In January 2007, the Commission directed CNSC staff to initiate research studies on tritium with the objective of enhancing the information available to guide the regulatory oversight of facilities that process tritium and facilities with tritium releases in Canada. In response, CNSC staff initiated the Tritium Studies Project (the Project) in June 2007. The results of the Project were outlined in the Tritium Studies Project Synthesis Report  and endorsed by the Commission in June 2010 . In January 2013, CNSC staff updated the Commission on the implementation of staff’s recommendations from the Project . At that time, staff outlined the work that had been completed to address the recommendations. None of the recommendations outlined in the Tritium Studies Project Synthesis Report were closed at that point. This document is a follow up to the CNSC’s Tritium Studies Project Synthesis Report and it summarizes the activities that staff have been involved in to address the recommendations from the Project. The information provided in this document was presented to the Commission in November 2017 . Based on work under the Tritium Studies Project, CNSC staff conclude that adequate provisions have been made through existing regulatory mechanisms for the protection of Canadians from exposure to tritium releases. Tritium is a radioactive form of hydrogen that emits low-energy beta radiation. It occurs naturally and as a by-product of the operation of nuclear reactors and tritium processing facilities. Tritium can pose a health risk if significant amounts are ingested through drinking water or food or if it is inhaled or absorbed through the skin in large quantities. The main forms of tritium in the biophysical environment are tritiated hydrogen gas (HT) and tritiated water (HTO). HT is less harmful to people than HTO because it is only weakly absorbed by the body. Organically bound tritium (OBT) is another important form of tritium found in biological systems (e.g., soil, plants and animals). It forms through the interchange of hydrogen with tritium in carbon-based molecules. OBT has a higher dose consequence relative to HTO because of the longer retention time of carbon-based molecules in the body (i.e., biological half-life). HTO clears from the body four times faster than OBT. HTO has a biological half-life of 10 days while OBT’s biological half-life is 40 days. A small fraction (about 0.01%) of inhaled HT gas is dissolved in bodily fluids and oxidized to HTO. Its biological half-life is also 10 days. In Canada, the control of tritium releases is particularly important. Tritium is produced as a by-product of the operation of CANDU (Canada Deuterium Uranium) and research reactors. Tritium removal facilities, like the one at Darlington, recover the tritium produced by the reactors. Some of the recovered tritium is processed and used to produce non-electrical self-luminescent military and aviation products. Taken together, these different aspects of the Canadian nuclear industry require the CNSC to be a leading expert in the fields of tritium regulation, the behavior of tritium in the terrestrial environment, and tritium radiobiology and dosimetry. The CNSC regulates environmental releases of tritium from nuclear reactors and tritium processing facilities and reviews the monitoring records collected by licensees as required by each licence. The CNSC also undertakes independent environmental monitoring in order to ensure that the health and safety of people and the environment are protected. The CNSC’s science-based regulatory framework is informed by research studies and national and international guidance and standards. Environmental protection at nuclear facilities is conducted in accordance with the Nuclear Safety and Control Act and its associated regulations to ensure that nuclear facilities are operating to protect the health and safety of people and the environment. The dose limit for any member of the public is 1 millisievert (mSv) per year. Actual doses to members of the public are calculated since they are typically too low to be measured. The calculated doses are based on measured activity concentrations from environmental monitoring programs, which are conducted by licensees to demonstrate compliance with the public dose limit. Doses to members of the public from tritium releases from operating nuclear facilities in Canada are low and well below levels known to cause health effects (around 100 mSv). For example, in Canada, doses to members of the public from tritium releases from nuclear facilities, as calculated by licensees’ programs, are in the range of 0.0001 to 0.01 mSv per year, which is a fraction of the public dose limit of 1 mSv per year. Nuclear facilities in Canada must demonstrate that non-human biota are protected from effects of radionuclide releases during normal operations. To help meet this requirement, an environmental risk assessment (ERA) is conducted to evaluate the potential risks to non-human biota associated with releases of tritium to the environment. ERAs for tritium-releasing facilities have shown negligible risk to non-human biota, given that the calculated dose rates were well below the radiation dose benchmarks for ecological receptors. Therefore, the environment is protected and exposure to tritium in the environment near nuclear facilities does not result in adverse effects on non-human biota. Continue research into the variability of ratios of OBT relative to HTO in order to better understand the underlying mechanisms, while assessing the sensitivity of dose estimates to high OBT/HTO ratios in foods. Undertake research to identify factors that need to be taken into account for adequate calibration of active and passive air samplers for tritium. Consider additional studies in radiobiology and dosimetry, including the review of the radiation weighting factor for low-LET radiation such as tritium. Address groundwater protection issues at existing facilities at the policy level in consultation with the provinces, which have legal jurisdiction over groundwater resources. Address groundwater protection issues for all new Class I nuclear facilities that release tritium to the atmosphere by considering new design requirements. The following sections outline the work that CNSC staff have carried out to address staff’s recommendations from the Project. Section 2.1 describes the work to investigate the variability of ratios of OBT relative to HTO (recommendation 1). Section 2.2 summarizes the research to identify factors that need to be taken into account for adequate calibration of active and passive air samplers for tritium (recommendation 2). Section 2.3 describes the additional studies in radiobiology and dosimetry that staff have been involved with (recommendation 3). Section 2.4 outlines the work to address groundwater protection issues at existing and new Class I facilities (recommendations 4 and 5). Section 3 describes other research projects and international initiatives that staff have been engaged in throughout the duration of the Project. Section 4 describes the CNSC laboratory’s increased tritium analysis capability and how this supported a number of analytical projects. The report concludes with a public dose calculation. The results of the calculation confirm that doses due to tritium exposure are low, and below levels known to cause health effects. The findings of the Project, including the additional work described here, have been summarized in the Tritium Studies Project Synthesis Report  and in seven information documents [6, 7, 8, 9, 10, 11, 12]. In addition, staff published four papers in the peer-reviewed scientific literature and a chapter in an encyclopedia on different aspects of the Tritium Studies Project [13, 14, 15, 16, 17]. Appendix A provides a summary of the information documents, conference presentations and research publications that were produced as a result of the Project. Follow-up research was conducted and is now published in several journal articles on factors that lead to variability in OBT/HTO ratios in soils and vegetation. New experimental work has confirmed that higher-than-expected OBT/HTO ratios may occur under certain conditions (e.g., when root uptake of tritium in plants is not the dominant pathway). From a regulatory perspective, using the higher OBT/HTO ratios results in only a small absolute effect on public dose for currently operating facilities. CNSC staff will continue to remain engaged in tritium research through participation in international working groups and ongoing dialogue with colleagues conducting tritium research. The work described in this section was conducted to address the recommendation from the Tritium Studies Project Synthesis Report regarding the variability in the ratio of OBT to tritiated HTO, or OBT/HTO ratio, in environmental samples. OBT in environmental samples is often estimated rather than measured due to the complexity of its analysis. The Canadian Standard Association (CSA) Group standard N288.1-14, Guidelines for calculating derived release limits for radioactive material in airborne and liquid effluents for normal operation of nuclear facilities, recommends an OBT/HTO ratio of 0.7 near atmospheric emission sources . This ratio assumes that OBT forms mainly from HTO under conditions under which tritium is constantly released and is based on achieving rapid equilibrium in tritium specific activity in different biological systems. However, research in the literature [19, 20, 21, 22, 23, 24] has reported ratios that are sometimes more than 10 times greater than the ratio stated in CSA N288.1-14. As such, CNSC staff investigated the possible causes of high OBT/HTO ratios by funding research to measure total tritium (HTO and OBT) in environmental samples. Altogether, two CNSC-funded research projects were completed by Dr. Ian Clark at the University of Ottawa to provide a more complete description of tritium in the terrestrial environment around Canadian nuclear facilities. The first study entitled "Environmental Fate of Tritium in Soil and Vegetation" measured HTO and OBT activity concentration in soil, garden produce, animal fodder and animal products near four tritium-releasing facilities during the 2008 and 2009 growing seasons . The research was conducted near two nuclear generating stations and two tritium-processing facilities (see figure 1). HTO activities in environmental samples were found to decrease with increasing distance from all facilities, approaching background levels within several kilometers. The relationship between OBT and distance was less pronounced. Similar to what has been noted in recent literature [11, 12], the OBT/HTO ratios were found to be generally greater than 1 near all the facilities. The mean OBT/HTO ratios for vegetation samples ranged from 1.0 ± 1.7 to 2.2 ± 2.6. The results were published in the Journal of Environmental Radioactivity . In 2012, CNSC staff both funded and actively participated in a follow-up project. The objective of the follow-up project was to narrow down the possible causes of the higher-than-expected OBT/HTO ratios using an experimental approach with enhanced monitoring of the environment. The objective of the "Tritium Transport in the Terrestrial Environment" study was to define the underlying conditions that led to the OBT/HTO ratios observed around a tritium processing facility that was previously investigated (i.e., SRB Technologies) . A second objective of the follow-up project was for the CNSC’s laboratory to improve its capabilities by conducting parallel tritium (i.e., HTO and OBT) analysis using split samples with University of Ottawa results and provide quality assurance. 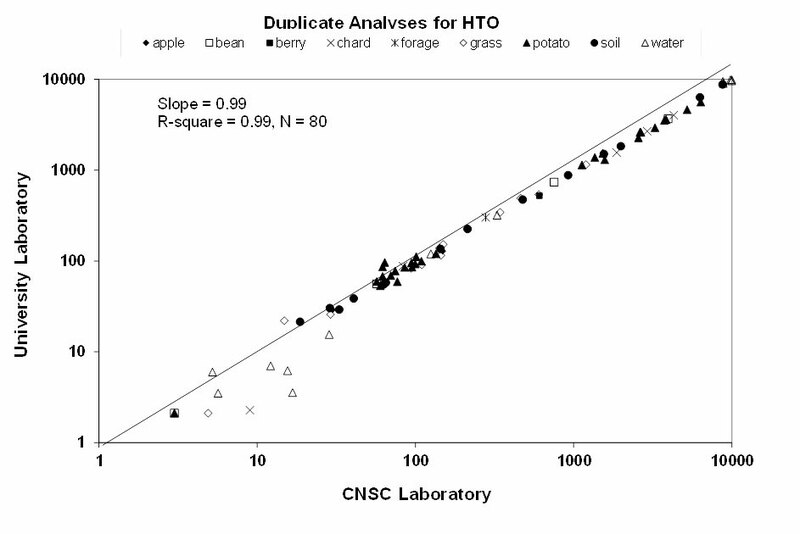 Figure 2 provides a comparison of HTO results in environmental samples analyzed by the University of Ottawa and the CNSC’s laboratories. As shown in figure 2, the results of the split samples analyzed in two laboratories are in good agreement. The follow-up project was conducted during the 2012 growing season near SRB Technologies (see figure 3). Garden produce and grass were grown while naturally exposed to operating releases from the facility. The growing vegetation was irrigated using three watering regimes (natural rainfall, low-tritium tap water and high-tritium well water). The purpose of using three watering regimes was to investigate the influence of different sources of tritium on environmental processes in the terrestrial environment. The follow-up project confirmed the high OBT/HTO ratios observed in CNSC staff’s previous research in further detail at one site [11, 12, 15]. The results were consistent with the exposure pathways and processes typical of the operating releases at this facility throughout the growing season. Specifically, plants irrigated with high-tritium well water (i.e., obtaining most tritium from root uptake) had OBT/HTO ratios near the expected ratio of 1. Similarly, all plants exposed to variable but low amounts of tritium in rain or tap water had OBT/HTO ratios slightly greater than 1. In contrast, those exposed to low amounts of tritium in air had OBT/HTO ratios near 10, confirming previous survey data. The results were presented by CNSC staff at the Third International Conference on Radioecology and Environmental Radioactivity and were published in the Journal of Environmental Radioactivity [16, 25]. The results of these two studies support the now large body of independent evidence that OBT/HTO ratios in plants and soils are often higher than those used in current environmental transfer models. Simple models that do not take into account less-studied environmental transfer processes, or the non-equilibrium state of actual operations (such as those assumed in CSA N288.1-14), may not adequately estimate OBT in different environmental media. OBT/HTO ratios therefore continue to be studied in different environmental media and locations by many scientific groups. CNSC staff have recently contributed to these efforts by revisiting mechanisms through which tritiated gas could contribute to elevated HTO and OBT results. This latest work was presented at the Fourth International Conference on Radioecology and Environmental Radioactivity . Further studies on the factors that influence OBT/HTO ratios are still needed to reach a scientific consensus before transfer models are likely to be revised. CSA N288.1-14 is reviewed on a five-year cycle and updated as needed. CNSC staff will continue to remain engaged in tritium research and will ensure that OBT-related matters are addressed appropriately in future revisions of the standard. In CNSC staff’s research, the dose to a member of the public from consuming food using the ratio from CSA N288.1-14 was explicitly compared to the dose using a ratio above 10 . The dose using the higher OBT/HTO ratio was approximately five times higher in relative terms. However, in both cases, the resulting ingestion dose was a small fraction of the public dose limit and below doses known to cause health effects. From a regulatory perspective, using a higher OBT/HTO ratio results in a small absolute effect on the dose consequence for currently operating facilities. This is because the ingestion dose from tritium is a small fraction of a person’s total dose. At this time, CNSC licensees are not required to revise how the concentrations of OBT in environmental samples are estimated for regulatory purposes (i.e., licensees continue to measure HTO in environmental media and mostly estimate OBT for dose analysis using the guidance from CSA N288.1-14). CNSC staff have been engaged in research to investigate the factors that may contribute to elevated OBT/HTO ratios in the environment. This research was conducted to meet the intent of the recommendation from the Tritium Studies Project Synthesis Report regarding underlying mechanisms that lead to the variability of the OBT/HTO ratios in environmental media. CNSC staff have addressed this recommendation through the research studies summarized here and are of the opinion that the intent of the recommendation has been met. CNSC staff will continue to remain engaged in tritium research through means such as participation in international working groups and ongoing dialogue with colleagues conducting tritium research. Follow-up research was conducted on uncertainties in tritium in air measurements from active versus passive sampling devices. Uncertainties have now been reasonably quantified and no further specific research on this topic is planned. From a regulatory perspective, people living around nuclear facilities are protected since the public dose estimated using data from both methods is a small fraction of the public dose limit. As part of the Tritium Studies Project, it was noted that there was a lack of precision in the tritium-in-air activity concentrations for compliance monitoring . A recommendation was made to investigate the factors that are needed for adequate calibration of passive and active air samplers. The CANDU Owners Group (COG) has also investigated these issues . Tritium in air may be monitored using active or passive air sampling. Passive air samplers consist of a liquid absorber, either water or a mixture of water and ethylene glycol, in a sampling container or vial with a cap (see figure 4). The cap has an orifice to allow HTO to diffuse into the vial. The liquid absorber is placed for set exposure time and then analyzed by liquid scintillation counting. Passive samplers are easy to set up and do not require mechanical pumps or a power source. However, they have been found to be less sensitive, less accurate and more variable compared to active samplers. The uncertainty may be as high as 50% for samplers located at the same site especially at low tritium-in-air activity concentrations . Active sampling consists of passing air through a liquid absorber or over molecular sieves using a mechanical pump for a set exposure time (see figure 5). In the case of the liquid absorber, a representative sample is taken and analyzed using liquid scintillation counting. For the samplers consisting of molecular sieves, the HTO is desorbed from the molecular sieve, collected and analyzed using liquid scintillation counting. Limitations of active samplers include the number of environmental parameters (e.g., temperature, relative humidity, flow rate, etc.) that must be monitored during sampling. The measurement of each of these parameters brings uncertainty, of which the magnitude is difficult to estimate, in the measured concentration. Active sampling using molecular sieves is used at all Canadian nuclear power plants for monitoring HTO in air. Active sampling using a bubbler (research facility) or passive sampling (tritium-processing facility) is used at the other tritium-releasing facilities. Health Canada and the Ontario Ministry of Labour use active sampling with molecular sieves for monitoring tritium in air around nuclear facilities. As part of the Canadian Radiological Monitoring Network, Health Canada monitors tritium in air around the Point Lepreau Generating Station and Gentilly-2 nuclear facility. The Ontario Ministry of Labour monitors tritium in air around the nuclear power plants in Ontario. 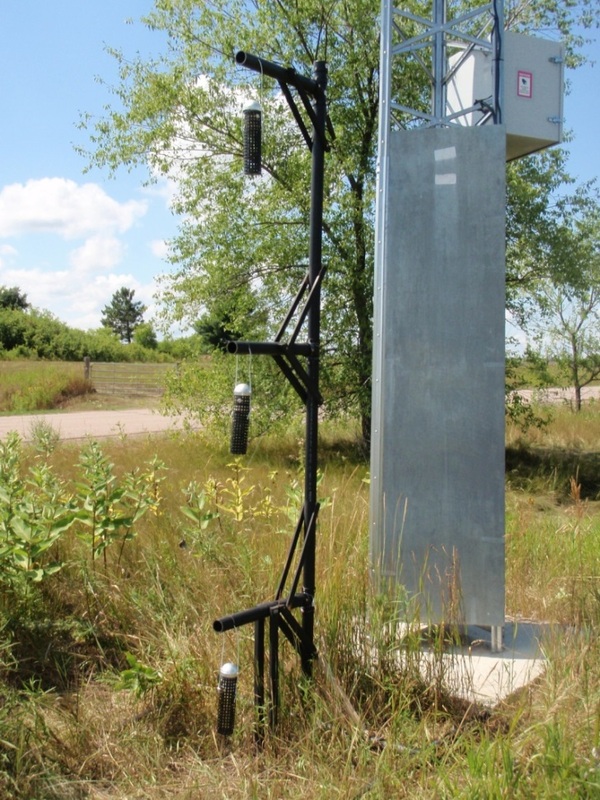 These additional monitoring stations, along with the air sampling conducted by CNSC staff as part of the Independent Environmental Monitoring Program (IEMP), provide additional verification of concentrations of tritium in air around nuclear facilities. These additional sources of measured tritium-in-air data are used for compliance verification of data from licensees’ environmental monitoring programs. A comparison of active and passive sampling of tritium in air was included as an objective of the final “Tritium Transport in the Terrestrial Environment” research project. 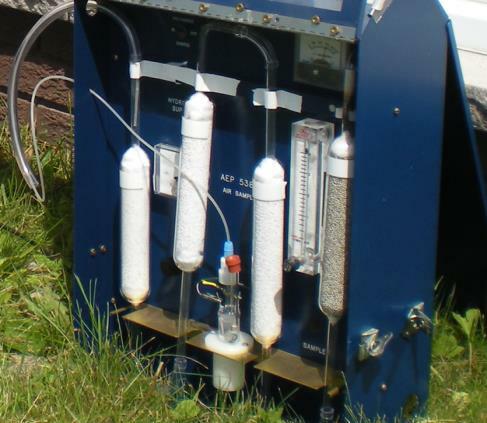 The University of Ottawa developed an active air sampler that was validated using an AECL active tritium-in-air sampler (see figure 5). The tritium-in-air field data that was collected from this project was fit for purpose in a research context and was included in journal publications, including the collaborative work that staff conducted with colleagues at the Japanese Atomic Energy Agency and Canadian Nuclear Laboratories (CNL) (refer to section 3). The public dose estimated by using from monitoring data using either active or passive samplers is low and well below the public dose limit. From a regulatory perspective, people living around nuclear facilities are protected since the public dose due to inhalation estimated using data from either method is a small fraction of the public dose limit. Additionally, licensees’ environmental and effluent monitoring programs, which are reviewed by CNSC staff, meet appropriate guidance and standards and the monitoring results are independently verified through the CNSC’s IEMP and other federal and provincial monitoring programs. CNSC staff are satisfied with licensees’ ability to calibrate either active or passive samplers and licensees may use either method, and are of the opinion that the intent of the recommendation has been met. CNSC staff will continue to remain abreast of the latest developments in tritium in air sampling technology. Follow-up research in tritium radiobiology and dosimetry was initiated in partnership with CNL, l’Institut de Radioprotection et de Sûreté Nucléaire (IRSN) and COG. This work is being published and is providing new insights into issues of both scientific and regulatory interest. CNSC staff conducted an independent comprehensive review and assessment of radiation protection principles and practices of tritium as part of the Project . Findings were presented to the Commission in June of 2010 in CMD 10-M38 . As a result of that work, staff recommended that additional studies in radiobiology and dosimetry – including the review of the radiation weighting factor for low-LET radiation, such as tritium – be considered to increase the body of knowledge on tritium. In response to CNSC staff’s recommendations, the "Studies on the Toxicity of Tritium: Effects of Low Dose Tritium and Gamma Radiations" Project (Toxicity of Tritium Project) was developed and led by CNL . The project is a multi-year collaboration between CNL (AECL at the start of the project), COG, IRSN and the CNSC. The CNSC provided funding and contributed to the project design and data analysis for certain tasks. Measure the uptake, retention and excretion profile of HTO. Measure the uptake, retention and excretion profiles of OBT, and compare HTO and OBT values at the various concentrations in mice to inform the calculation of total whole body dose and dose rate in mice. Determine whether exposure to low doses of tritium (i.e., HTO and OBT) and gamma radiation delivered at low dose rates induces non-cancer health effects. Determine whether exposure to tritium and gamma radiation delivered at low dose rates induces cytotoxic effects in mouse tissue. Determine whether exposure to tritium and gamma radiation delivered at low dose rates induces DNA inversions (i.e., a specific type of DNA damage) in mice. Compare the toxicity of equally administered doses of tritium as HTO and OBT to external gamma radiation dose by assessing tumor incidence and latency. The results of tasks 1, 2 and 4 have been published in peer-reviewed journals by CNL and IRSN [31, 32]. A summary article co-authored by CNSC staff highlighting the results of tasks 1 to 3 has been accepted for publication in the peer-reviewed literature. Additional articles by CNL are also anticipated. Tasks 1 and 2 demonstrated that the results of this work are not consistent with the International Commission on Radiological Protection (ICRP) biokinetic model [33, 34]. The models established by ICRP  predict that HTO behaves like water, with an immediate uniform distribution in bodily tissues. On the other hand, the ICRP also predicts that OBT is distributed heterogeneously in body tissues and has a longer retention time. The CNL results are in contrast to the ICRP model. HTO and OBT had similar uptake, retention and excretion patterns (i.e., OBT behaved like ingested water rather than following a carbon-based physiological cycle). This biokinetic model could impact the way in which tritium exposures are estimated. Further study is needed to validate these results. Currently, there is not enough weight of evidence to deviate from the ICRP biokinetic model. From a regulatory perspective, dose consequences from tritium exposures are a small fraction of a person’s total dose and well below dose limits for workers and members of the public. Tasks 1 through 4 allow for a comparison of the relative toxicity of tritium (HTO and OBT) and gamma radiation. Understanding of these comparisons with consideration of ongoing work will help determine an appropriate relative biological effectiveness (RBE) for tritium radiation. RBE is a concept used to compare different types of radiation in terms of the same biological effect. The RBE of tritium varies depending on whether X-rays or gamma radiation was used as the reference. In the literature, a wide range of values have been reported as the reference radiation. For example, X-rays typically vary between 180 and 250 kilovolt peak (kVp), and gamma radiation is typically a cesium-137 (662 kVp) or cobalt-60 (a total of 2,500 kVp) sourceFootnote1 . The intent of this recommendation has been met through with a commitment to collaborative research with several partners addressing uncertainties in radiobiology and tritium dosimetry. Additional studies will continue as part of CNSC staff`s ongoing research agenda. CNSC staff have adjusted the regulatory framework for controlling releases and protecting groundwater. To address groundwater protection matters, the CNSC followed its process for considering changes to its regulatory framework. The outcome of this process, which involved extensive consultation with stakeholders, contributed to the development of a CSA standard. The objective of ensuring that groundwater protection has been adequately reflected in CNSC’s regulatory framework has been achieved. One of the recommendations of the Tritium Studies Synthesis Report was to address groundwater protection issues at existing facilities at the policy level and for all new Class I nuclear facilities that release tritium to the atmosphere by considering new design requirements . DIS-12-01, Protection of Groundwater at Nuclear Facilities in Canada . DIS-12-02, Process for Establishing Release Limits and Action Levels at Nuclear Facilities . Both discussion papers underwent extensive public review. The public comments were addressed by CNSC staff, and What We Heard Reports were published [38, 39]. The following provides a brief summary of the current status of both discussion papers. DIS-12-01 addressed the integration of groundwater protection within the CNSC’s overall environmental protection framework. Specifically, it outlined CNSC’s expectations regarding the essential elements of a groundwater protection program. The requirements of the discussion paper were formalized as guidance as part of CSA N288.7, Groundwater protection at Class I nuclear facilities and uranium mines and mills (N288.7-15) . Groundwater protection principles were also incorporated into the CNSC’s REGDOC-2.9.1, Environmental Protection: Environmental Principles, Assessment and Protection Measures (2016) . CSA N288.7-15 and REGDOC 2.9.1 provide consistent, similar guidance. DIS-12-02 addressed establishing release limits, action levels, and effluent design objectives for radionuclides and hazardous substances released from nuclear facilities. A part of this discussion paper included the recognition of groundwater as a valued ecosystem component to be protected and considered when designing nuclear facilities. Requirements and guidance for controlling releases to the environment, which includes consideration of groundwater as an end use to be protected, will be incorporated in a future CNSC regulatory document. The intent of this recommendation has been met. The recommendations on groundwater protection have been addressed through the publication of a CSA standard as well as REGDOC 2.9.1. CNSC staff also participated in other research projects and international initiatives related to the follow-up research recommended in the Project. In particular, CNSC staff participated in both phases of the International Atomic Energy Agency (IAEA) program Modelling and Data for Radiological Impact Assessment (MODARIA). This collaboration resulted in a key journal article modelling recent CNSC field research with colleagues from the Japanese Atomic Energy Agency (JAEA) and CNL. CNSC staff also hosted a three-day tritium workshop with scientists from the CNSC, IRSN, CNL and the University of Ottawa to discuss emerging topics. CNSC staff will continue to engage in similar scientific activities, but are of the opinion that there is no need to actively participate in more detailed studies from a regulatory perspective. The IAEA has been hosting a program on radiological impact assessment since 1996. CNSC staff participated in various aspects of this program. The last two programs were under the acronyms MODARIA I (2012–15) and MODARIA II (2016–18)). As part of MODARIA I and II, staff participated in a working group whose objective was to further develop and test models for accidental (or acute/pulsed routine) tritium releases in order to improve understanding of the behaviour of tritium in the terrestrial environment . During the MODARIA I and II programs, CNSC staff worked with the JAEA and CNL to investigate the underlying physical processes that may lead to elevated tritium activities in soil and vegetation. The results of the "Tritium in the Terrestrial Environment" research project  were used as input into the two tritium models developed and maintained by the JAEA and CNL. The results of this work demonstrated that the transfer of HTO from soil to leaf can strongly influence tritium dynamics in the leaves of vegetation. This process can dominate the OBT/HTO ratio in the leaf regardless of the atmospheric HTO activity concentration as the elevated HTO activity concentration is maintained in the soil. The results of this collaborative research indicate that assessment models should be refined to consider the importance of soil-to-leaf HTO transfer to ensure that dose estimates are accurate and conservative. In April 2016, CNSC staff hosted a three-day tritium workshop. The workshop brought together scientists from the CNSC, IRSN, CNL and the University of Ottawa to discuss emerging topics in tritium research. The purpose of the workshop was to generate ideas to direct future CNSC research on tritium in order to expand on the body of work completed under the Project. These research initiatives are being pursued by the various research institutes. The results of these research initiatives may contribute to the explanation of the underlying mechanism for how tritium behaves in the terrestrial environment. However, the results are not anticipated to alter how the CNSC regulates tritium-releasing facilities. Staff will remain informed of emerging issues and findings, through means such as continued participation in international working groups and engagement with colleagues at various international institutions. To support research stemming from the Project, and to enhance regulatory effectiveness in diverse contexts, the CNSC has been increasing its laboratory capabilities with respect to the analysis of tritium. The laboratory now has the ability to analyze the two major forms of tritium – HTO and OBT – with state-of-the-art equipment. The laboratory has analyzed more than 2,500 samples since 2012 to support research projects, the CNSC’s Independent Environmental Monitoring Program (IEMP), national and international inter-comparison tritium measurement exercises, and an IAEA network training course. In 2012, the CNSC laboratory expanded its analytical capability to include the analysis of OBT in environmental samples as part of the "Tritium in the Terrestrial Environment" research project. Prior to 2012, the laboratory was capable of analyzing only HTO in environmental samples. OBT is typically analyzed in environmental samples using the Parr oxygen combustion method followed by liquid scintillation counting of the collected combustion water. This methodology has been used for OBT analysis in the CNSC laboratory. In 2015 and 2016, the CNSC laboratory added two new pieces of sample preparation equipment (RADDEC Oxidizer and RADDEC Pyrolyzer) for the extraction of OBT from environmental samples. The CNSC laboratory has been one of the first laboratories worldwide to acquire these new commercially available pieces of equipment that facilitate the extraction of OBT from larger environmental sample sizes. CNSC staff, along with the manufacturers, published an article in peer-reviewed literature on the use and implementation of the equipment . CNSC staff remain abreast of current methods and techniques for tritium analysis by participating in national and international working groups. An international OBT analysis working group was formed in 2012 with members from six countries (Canada, France, United Kingdom, Romania, South Korea and Japan). This working group meets annually to discuss improvements in the analysis of OBT and organize inter-comparison exercises. The CNSC laboratory has participated in all the inter-comparison exercises organized by this working group since 2012. The CNSC laboratory has consistently achieved a passing score of 100%, which corresponds to very good results. The results of the first OBT inter-comparison exercise (2012) were summarized in the Journal of Environmental Radioactivity in a paper co-authored by CNSC staff . CNSC staff also participated in an inter-comparison field study with IRSN in June and July 2013. This study was carried out near SRB Technologies in Canada for a two-week period. The objective of this field campaign was to compare and validate the methods used for sampling and measuring tritium. Measurements were made of HT, HTO and aerosols in air, as well as HTO and OBT in grass samples. The results obtained by IRSN and CNSC showed good agreement for HTO in the air and grass samples. However, OBT activity concentration results for three of the grass samples differed between laboratories more than expected. To pinpoint the source of the difference in these grass sample results, the laboratories exchanged and analyzed each other’s split samples. The analysis obtained showed good agreement for those samples, which indicated the differences were due to the inhomogeneity of the split samples and not due to the analytical measurements. Altogether, the results of the CNSC laboratory’s participation in this inter-comparison field campaign provided additional verification of the laboratory’s capabilities in analyzing tritium. The collaborative research with IRSN resulted in the publication of an internal IRSN report and a peer-reviewed journal publication . In September 2016, the CNSC laboratory hosted a workshop as part of the IAEA’s Analytical Laboratories for the Measurement of Environmental Radioactivity (ALMERA) network training courses (see figure 7). ALMERA is a worldwide network of analytical laboratories that are coordinated centrally by the IAEA’s Environmental Laboratories. The network of laboratories is expected to analyze environmental samples in the case of an accidental or intentional radiological release. The fall 2016 workshop focused on sample preparation and on the detection of OBT in food samples using liquid scintillation counting. The workshop included participants from 14 different countries: Singapore, the Republic of Korea, United Arab Emirates, Tunisia, the Netherlands, Madagascar, the Czech Republic, Slovenia, Mexico, Brazil, Turkey, Portugal, Estonia and Austria. 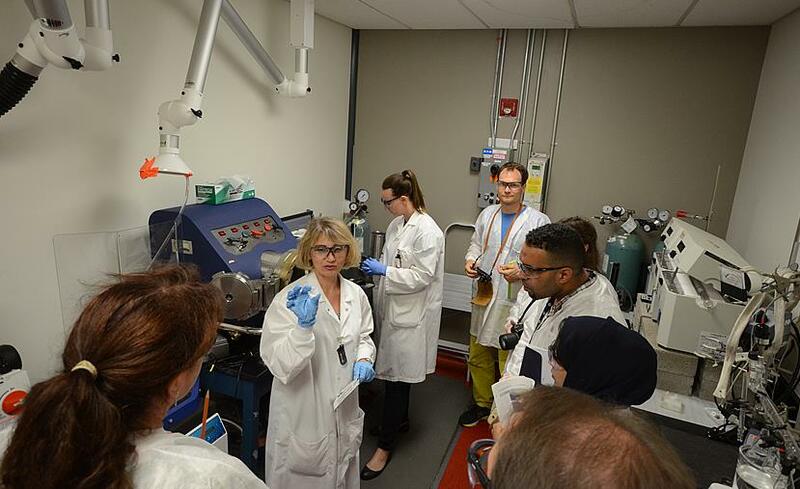 The training provided as part of the CNSC-hosted workshop allowed the participants to implement the techniques and methodologies that they acquired in their countries’ analytical laboratories. Since the Project’s completion, the CNSC has initiated routine HTO and OBT measurements through the IEMP as a strategic activity. Through this program, which is conducted independently of licensees, CNSC staff take samples of different environmental media (e.g., air, water, soil, food) from publicly accessible locations and analyze them at the CNSC laboratory for nuclear and hazardous substances related to the facility’s operation. The results are reported to the public through a Web interface and are compared to levels protective of human health. The IEMP complements the information collected by licensees and supports the CNSC’s compliance verification program. Results have also been used to provide an independent estimate of public dose with the details provided here. Altogether, the IEMP has shown that levels of tritium near nuclear facilities in Canada are all well below relevant health criteria. The IEMP has collected unique OBT data with state-of-the-art technology, and has shared this expertise internationally through various working groups. Licensees thoroughly monitor HTO and use that information for public dose estimates, but extensive monitoring of OBT is still not routine (hence OBT is often modelled). This is due to a lack of a single standardized method(s) and certified reference materials. Through the IEMP, CNSC staff have made a significant contribution towards developing a future scientific consensus on how OBT measurements could be incorporated in monitoring programs. Since 2012, a number of IEMP sampling campaigns were completed around tritium-releasing facilities. The facilities that were monitored along with their sampling dates are provided in Table 1. Note: Shield Source Incorporated no longer operates and the facility has been released from regulatory oversight. Note: The Gentilly-2 nuclear facility was permanently shutdown in December 2012. Samples were collected and analyzed for HT and HTO in air, HTO in soil, as well as HTO and OBT in available locally grown foodstuffs (e.g., milk, meat, fish, fruits and vegetables). Table 2 provides a summary of the range of results measured in air, water, and soil for each nuclear facility for all years sampled at that facility. Table 3 provides a summary of IEMP results in food. There is variation in the results both temporally and spatially around a facility. Higher activity concentrations were generally measured at sampling locations closer to the facility. Screening levels for human health are also provided to indicate a concentration of radioactivity where no further investigation is required. In all cases the IEMP results were well below the CNSC screening levels. Screening levels were developed by CNSC staff using the methodology outlined in CSA standard N288.1-14  and conservative assumptions. The screening level for a particular radionuclide in a particular medium (e.g., water, air, foodstuffs) represents the activity concentration that would result in a dose of 0.1 mSv per year, a dose at which no health impacts are expected. Note: Values in bold represent the maximum activity concentration for that media. This was the value used in the dose calculation for members of the public. It should be noted, however, that IEMP sampling is conducted only once a year at a select number of sites. Results represent a reliable snapshot in time of representative locations. The IEMP is not intended to capture all of the temporal and spatial variability that is more rigorously targeted by the licensee’s environmental monitoring program. The dose calculation used the generic methodology outlined in CSA standard N288.1-14  to calculate an annual effective dose using the measured tritium from the IEMP results. The dose calculation is based on the maximum tritium concentration measured for each environmental media and foodstuff in tables 2 and 3. Thus, the results are not specific to any nuclear facility and are conservative. The receptor lives 24 hours a day, 365 days a year at the exposed location (for inhalation and immersion). The only source of drinking water is from the measured tritium source. Results below the detection limit were set to the detection limit value. Inhalation and ingestion rates of various media for the three age classes (infant, child, and adult) are provided in appendix B (Table B.1). The approach used allows for simplistic high-level and conservative dose estimates. The detailed dose contributions from each pathway along with the total effective tritium dose are outlined in appendix B (table B.2 – table B.4). Table 4 summarizes the total tritium dose for the infant, child and adult receptor based on the dose calculation using IEMP monitoring results. The adult receptor receives the highest tritium dose as a result of having a higher rate of consumption of water than a child or infant and a higher inhalation rate than an infant. For all receptors, the results indicate that the dose contribution from exposure to tritium via air immersion and inhalation is the major contributor to the total tritium dose (69.9%), with second highest contributor being the dose contribution from ingestion and immersion of water (29.6%) (see figure 9). 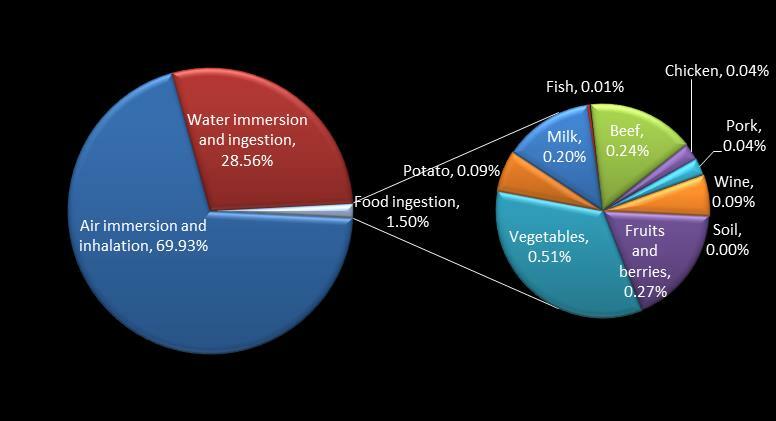 Consumption of all food sources sampled contributed to only 1.5% of the total tritium dose. 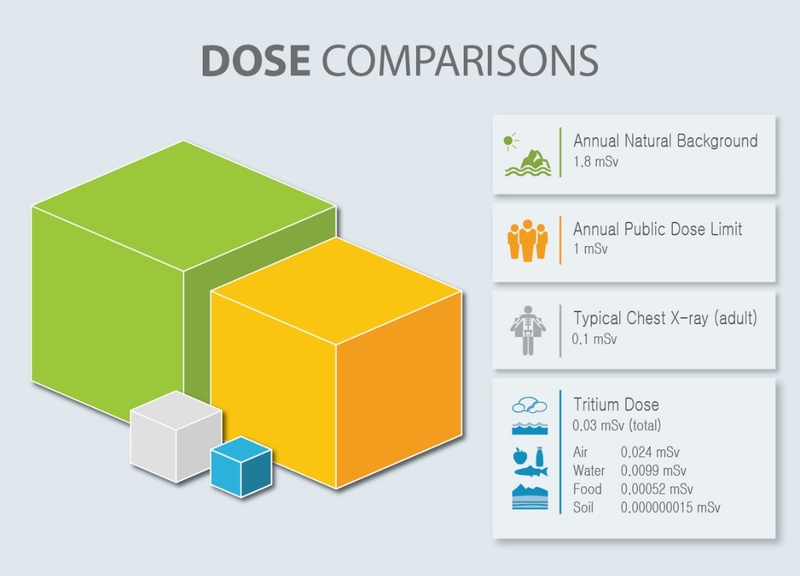 For all receptors, the total dose contribution from tritium is about 100 times lower than the public dose limit of 1 mSv per year and over 100 times lower than the Canadian natural background  (see Figure 10). In general, these results confirm what has been reported by the licensees’ monitoring programs. However, in some cases, the calculated dose to the infant, child and adult receptors may be higher than those reported by licensees in their annual compliance reports due to the conservative assumptions that were used. The objective of this dose calculation was to illustrate that doses to members of the public living around nuclear facilities that emit tritium are below regulatory dose limits and doses known to cause health effects. The CNSC’s current regulatory oversight of tritium-releasing facilities in Canada demonstrates that doses to members of public living near these facilities are low and below levels known to cause health effects. CNSC staff have engaged in several research projects to expand the body of knowledge on tritium releases and to enhance the regulatory oversight of tritium-related activities. Project findings have been communicated to the Commission and the public through Commission meetings, open houses, eight CNSC information documents, papers in peer-reviewed scientific literature and a chapter in an encyclopedia. Research conducted as part of the Project resulted in the CNSC laboratory expanding its capability to analyze tritium in environmental samples. This has allowed the laboratory to support CNSC-funded research projects, participate in national and international inter-comparisons and analyze samples as part of the CNSC’s Independent Environmental Monitoring Program. Staff at the CNSC’s laboratory remain up-to-date with the latest techniques by participating in working groups and field research. The results of the CNSC’s IEMP data collected around facilities that emit tritium were used to estimate dose to a member of the public. Conservative assumptions were used in the dose calculation. The results support the conclusion that the dose to a member of the public due to exposure from tritium releases is a small fraction of the regulatory dose limit and levels known to cause health effects. As a result of the follow-up work that CNSC staff have now completed, staff are of the opinion that the recommendations from the Tritium Studies Project Synthesis Report have been met. CNSC staff note that tritium science continues to be a major topic of public interest with parallel research activities under way internationally. CNSC staff will therefore, continue to ensure that the latest developments in tritium science are integrated in regulating tritium-emitting nuclear facilities. Overall, the Project has met its objective of increasing the information available regarding tritium releases and enhancing the regulatory oversight of tritium-releasing facilities. CNSC staff will continue to remain informed of the latest developments in tritium science to ensure that the regulatory oversight of nuclear facilities remains robust. Based on the research that has been previously presented to the Commission and staff’s subsequent work, CNSC staff conclude that adequate provisions have been made through existing regulatory mechanisms for the protection of all Canadians from exposure to tritium releases. Thompson, P.A., et al. 2011. Revue de l’état des connaissances des effets du tritium sur la santé et l’environnement au Canada–un outil pour orienter la surveillance réglementaire (Review of the knowledge available to date on the effects of tritium exposure on health and the environment in Canada–a tool to guide regulatory compliance monitoring). Radioprotection 46: 511-531. Kim, S.B., et al. 2015. Canadian inter-laboratory organically bound tritium (OBT) analysis exercise, J. Environ. Radioact. 150:235-241. Connan, O., et al. 2015. 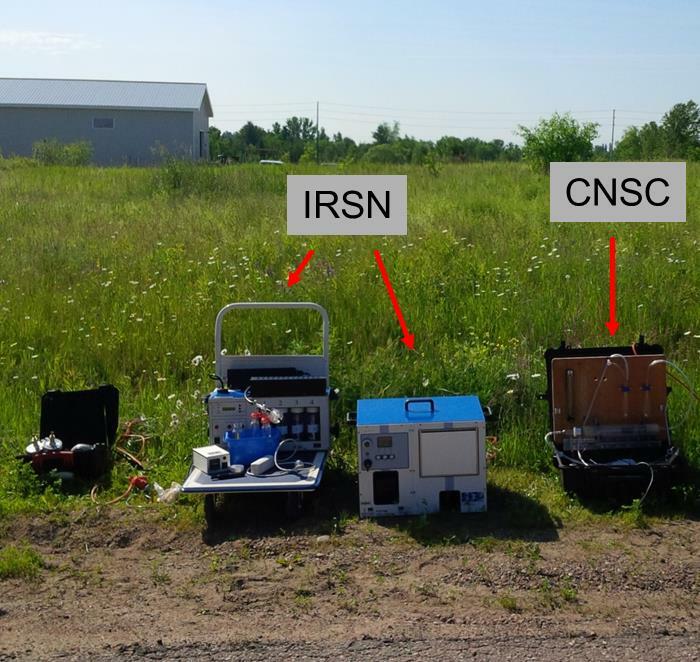 In situ measurements of tritium evapotranspiration (3H-ET) flux over grass and soil using the gradient and eddy covariance experimental methods and the FAO-56 model. J. Environ. Radioact. 148:1-9. Thompson, P.A., et al. 2015. 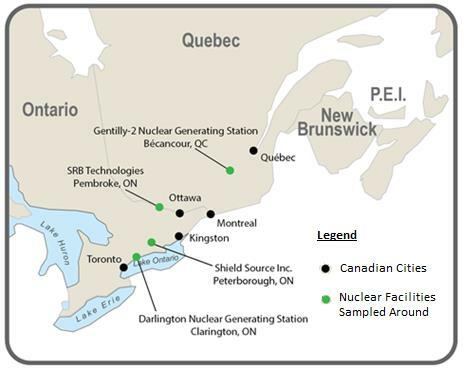 Levels of tritium in soils and vegetation near Canadian nuclear facilities releasing tritium to the atmosphere: Implications for environmental models. J. Environ. Radioact. 140:105-113. Mihok, S., et al. 2016. 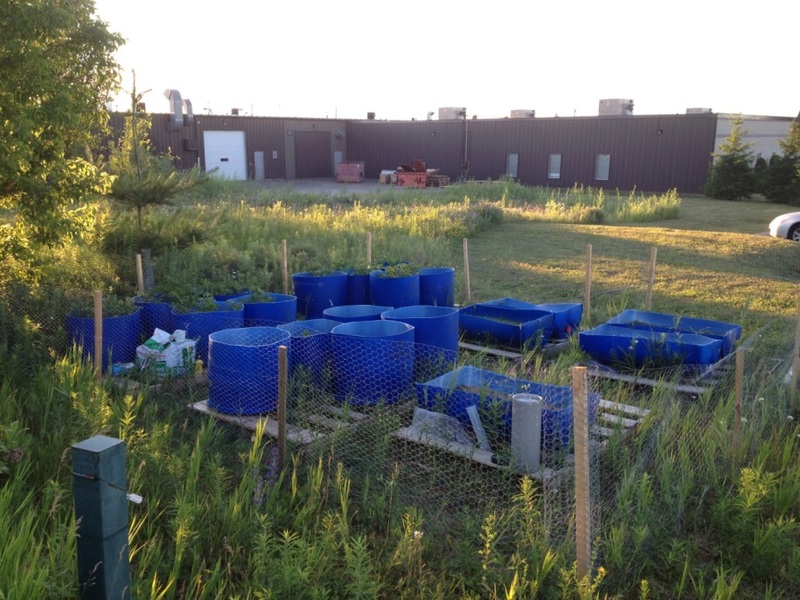 Tritium dynamics in soils and plants grown under three irrigation regimes at a tritium processing facility in Canada. J. Environ. Radioact. 153:176-187. Marsh, R.I., et al. 2017. A new bomb-combustion system for tritium extraction. J. Radioanal. Nucl. Chem., DOI 10.1007/s10967-017-5446-0. Ota, M., et al. 2017. Role of soil-to-leaf tritium transfer in controlling leaf tritium dynamics: Comparison of experimental garden and tritium-transfer model results, J. Environ. Radioact. 178-179, 212-231. Guéguen, Y., et al. 2018. In vivo animal studies help achieve international consensus on standards and guidelines for health risk estimates for chronic exposure to low levels of tritium in drinking water. Environmental and Molecular Mutagenesis. 59(7): 586-594. Mihok, S., Wilk, M., Lapp, A., St-Amant, N., and Kwamena, N.-O.A., Clark, I.D. "Tritium Dynamics in Soil and Plants." Presented at the Third International Conference on Radioecology and Environmental Radioactivity, September 2014, Barcelona, Spain. Korolevych, V., Kim, S.B, Kwamena, N.-O.A., Ota, M., Le-Dizes-Maurel, S., Maro, D., Aulagnier, C., Patryl, L. "Field Testing and Intercomparison of Advanced Tritium Transfer Models." Presented at the 11th International Conference on Tritium Science and Technology, April 2016, Charleston, South Carolina. Ilin, M., and Rinker, M. "Role of Tritiated Hydrogen in Formation of HTO and OBT in Soil and Vegetation in Vicinity of a Tritium Processing Facility." Presented at the Fourth International Conference on Radioecology and Environmental Radioactivity, September 2017, Berlin, Germany. CNSC. INFO-0766, Standards and Guidelines for Tritium in Drinking Water, Ottawa, 2008. CNSC. INFO-0792, Investigation of the Environmental Fate of Tritium in the Atmosphere, Ottawa, 2009. CNSC. INFO-0793, Tritium Releases and Dose Consequences in Canada in 2006, Ottawa, 2009. CNSC. INFO-0796, Evaluation of Facilities Handling Tritium, Ottawa, 2010. CNSC. Tritium Activity in Garden Produce from Pembroke in 2007 and Dose to the Public, Ottawa, 2010. CNSC. Health Effects, Dosimetry and Radiological Protection of Tritium, Ottawa, 2010. CNSC. Tritium Studies Project Synthesis Report, Ottawa, 2011. CNSC. Environmental Fate of Tritium in Soil and Vegetation, Ottawa, 2013. Canadian Nuclear Safety Commission (CNSC). CMD 10-M38, Tritium Studies Project Synthesis Report, Ottawa, 2010. CNSC. Minutes of the Canadian Nuclear Safety Commission (CNSC) meeting, June 28–29, 2010. CNSC. CMD 13-M5, Update on the implementation of recommendations from the Tritium Studies Synthesis Report, Ottawa, 2012. CNSC. CMD 17-M48, Update on the Implementation of Recommendations from the Tritium Studies Synthesis Report, Ottawa, 2017. Thompson, P.A., et al. 2011. Revue de l’état des connaissances des effets du tritium sur la santé et l’environnement au Canada – un outil pour orienter la surveillance réglementaire (Review of the knowledge available to date on the effects of tritium exposure on health and the environment in Canada–a tool to guide regulatory compliance monitoring). Radioprotection 46: 511-531. Bundy, K., et al. Radiation Effects of Tritium. R.A. Meyers (ed.) Encyclopedia of Sustainability Science and Technology. New York: Springer Science, 2012. CSA Group. CSA N288.1-14, Guidelines for calculating derived release limits for radioactive material in airborne and liquid effluents for normal operation of nuclear facilities, Mississauga, 2014. Jean-Baptiste, P., et. al. 2007. The distribution of tritium in the terrestrial and aquatic environments of the Creys-Malville nuclear power plant (2002–2005). J. Environ. Radioact. 94:107–118. Kim, S.B., et al., 2008. 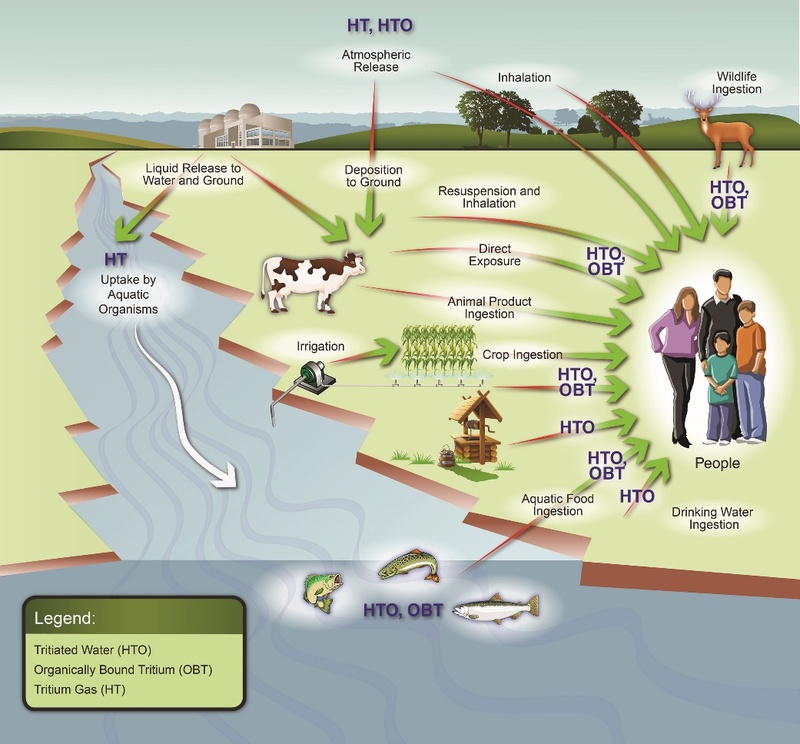 HTO and OBT concentrations in a wetland ecosystem. Fusion Sci. Technol. 54:248–252. Kim, S.B., S.L. Chouhan, and P.A. Davis. 2011. Observed and modelled tritium in the wetland ecosystem in Duke Swamp near a nuclear waste management area. Fusion Sci. Technol. 60:960–963. Kim, S.B., M. Bredlaw, and V.Y. Korolevych. 2012. HTO and OBT activity concentrations in soil at the historical atmospheric HT release site (Chalk River Laboratories). J. Environ. Radioact. 103:34 40. Baglan, N., et al. 2011. A follow up of the decrease of non-exchangeable organically bound tritium levels in the surroundings of a nuclear research center. J. Environ. Radioact. 102:695–702. Korolevych, V., S.B. Kim, and P.A. Davis. 2014. OBT/HTO ratio in agricultural produce subject to routine atmospheric releases of tritium. J. Environ. Radioact. 129:157–168. Ray, A., Ilin, I., Avadhanula, R., and Mihok. S., to Hamlat, H.S., Rinker, M., and Thompson, P. Memo, Passive Diffusion and Conventional Active Tritium (HTO)-in-Air Sampling, January 18, 2010. University of Ottawa. Review of 2012 Activities and Results, 2012. University of Ottawa. Environmental Fate of Tritium in Soil and Vegetation – Final Report, 2010. Canadian Nuclear Laboratories and IRSN. Tritium Toxicity Project Final Report, 2015. Bannister, L., et al. 2016. Environmentally relevant chronic low-dose tritium and gamma exposures do not increase somatic intrachromosomal recombination in pKZ1 mouse spleen. Radiat. Res.186:539-548. Priest, N.D., et al. 2017. Tritium (3H) retention in mice: administered as HTO, DTO or as 3H-labeled amino acids. Health Physics. 112:439-444. ICRP. ICRP Publication 56, Age-dependent doses to members of the public from intakes of radionuclides – Part 1. Pergamon Press, Oxford. 1989. CNSC. DIS-12-01, Protection of Groundwater at Nuclear Facilities in Canada, Ottawa, 2012. CNSC. DIS-12-02, Process for Establishing Release Limits and Action Levels at Nuclear Facilities. Ottawa, 2012. CNSC. What We Heard Report: DIS-12-01 Protection of Groundwater at Nuclear Facilities in Canada, Ottawa, 2014. CNSC. What We Heard Report, DIS-12-02 Process for Establishing Release Limits and Action Levels at Nuclear Facilities, Ottawa, 2014. CSA Group. N288.7, Groundwater protection at Class I nuclear facilities and uranium mines and mills. Mississauga, 2015. CNSC. REGDOC-2.9.1, Environmental Protection: Environmental Principles, Assessment and Protection Measures, Ottawa, 2016. CSA Group, N288.1-14, Guidelines for calculating derived release limits for radioactive material in airborne and liquid effluents for normal operation of nuclear facilities, Mississauga, 2014. Gratsy, R.L., and Lamarre, J.R. 2004. The annual effective dose from natural sources of ionizing radiation in Canada, Radiat. Prot. Dosim. 108: 215-226. The unit kVp refers to the maximum voltage in an x-ray tube where a distribution is present. The unit keV is a unit of energy that reflects the energy gained (or lost) by the charge of a single electron moving across an electric potential difference of 1 volt. These units can be treated as equivalents.